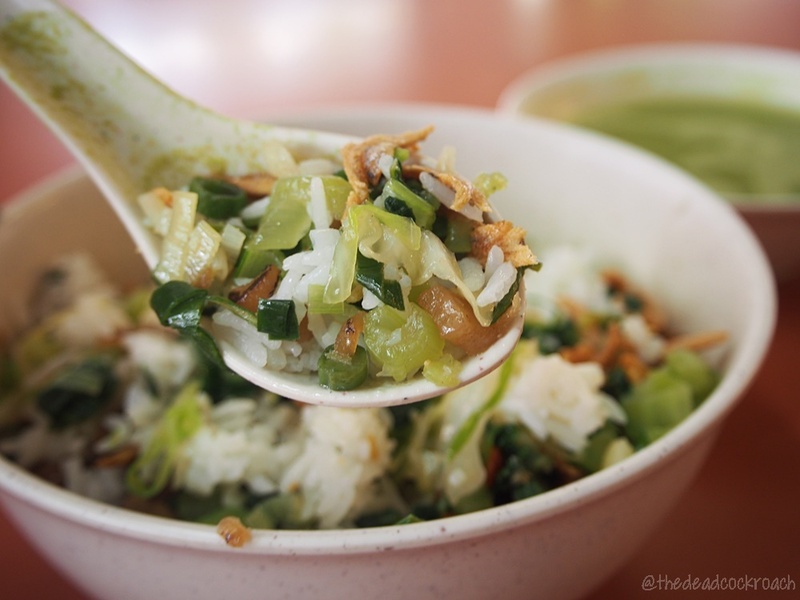 The thunder tea rice stall at Tanglin Halt Food Centre is one of the more popular options that draw a perpetual queue during lunch hour. When I was there, customers were already crowding in front of the stall waiting for them to open for business at 11am. As the opening hour neared, the crowd automatically formed a line in a orderly manner. While standing in the queue, I observed that the stall owner is working inside the stall without switching on the lights. Makes one wonder how does he see in the dark? 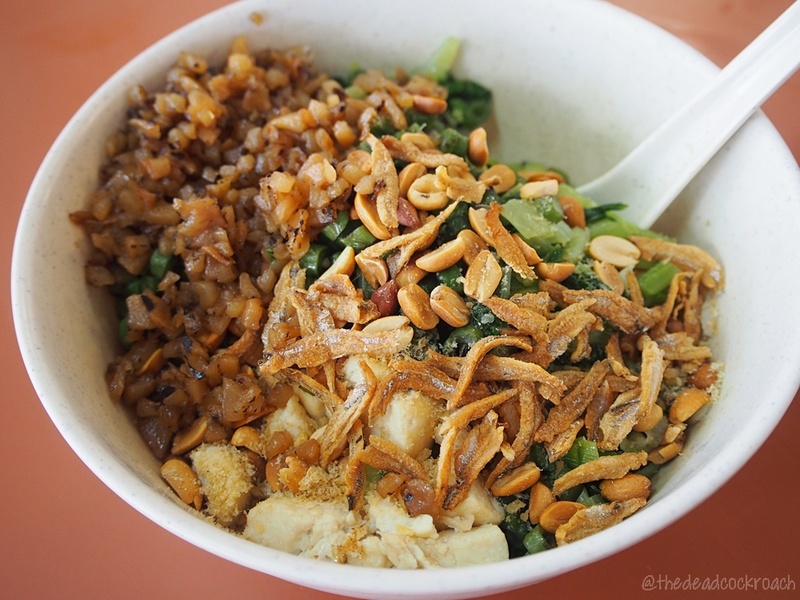 The bowl is rather light on flavors as the chye poh is the sweet variety. However, the seasoning from the vegetable makes up for it. While everything was chopped up for easy eating, the ikan bilis and peanuts added some crunch and texture to the dish. As I eat, I realized that vegetables like sayur manis, cabbage and long beans which are commonly found in the dish is absent here. 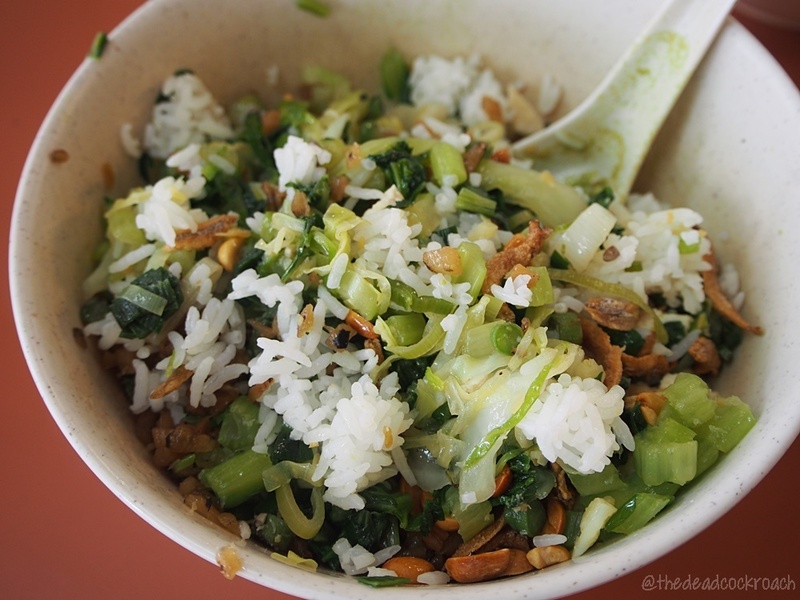 It is not easy to find a thunder tea rice stall that provided the whole works. 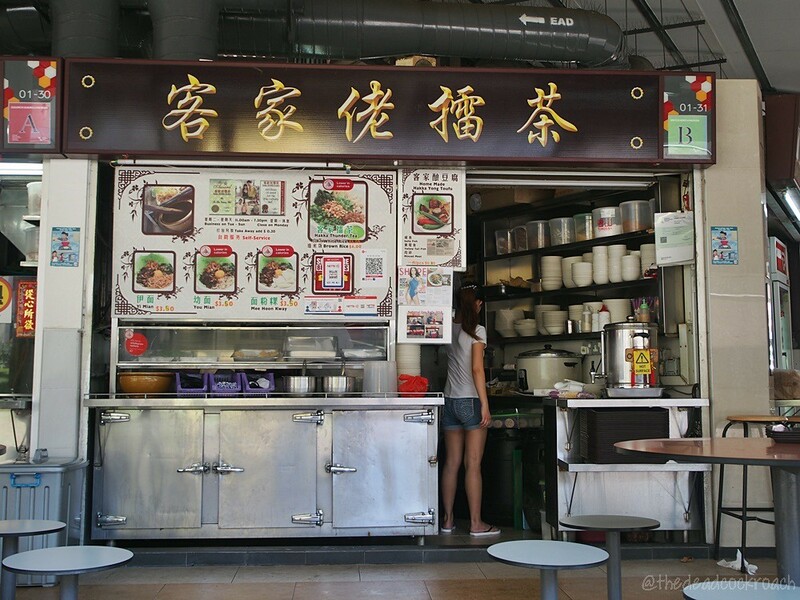 They have a small selection of yong tau foo (80¢ each) which they handmade themselves. There are tau kwa, bitter gourd, brinjal, chili and ladies finger all stuffed with a mixture of salted fish, minced meat and fish paste. I also see golf ball-sized meatballs. 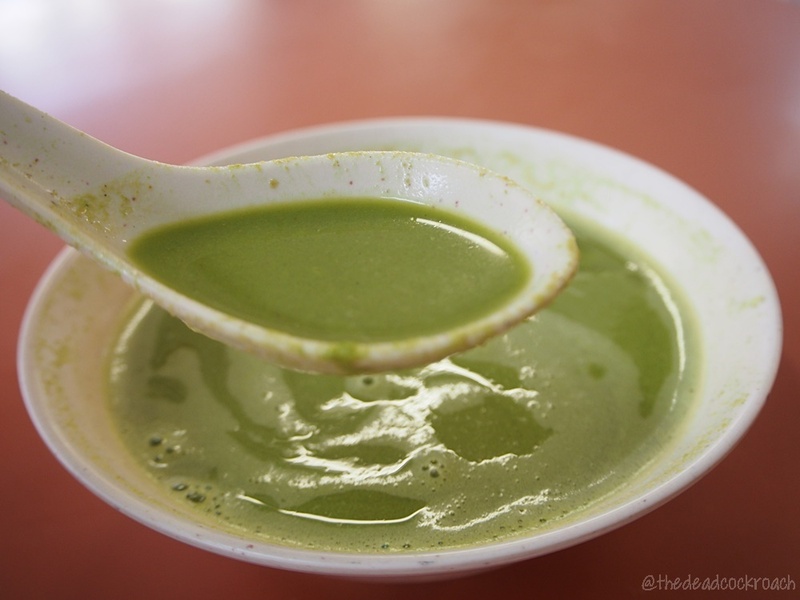 The thunder tea broth is made by grinding a mixture of herbs, tea leaves, sesame seeds and peanuts into a paste. Hot water is later added to dilute the paste into a broth. It tasted nutty, with hints of mint, basil and other intricate flavors. 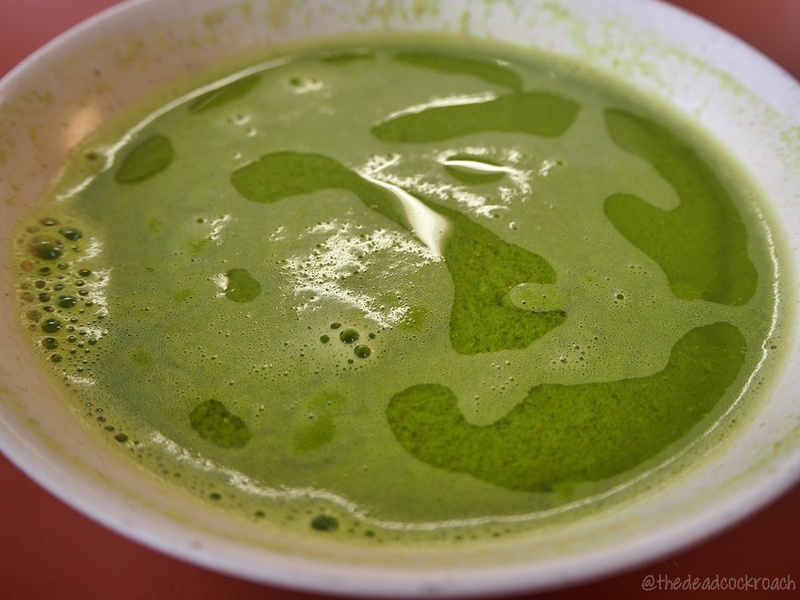 Although the color of the tea looked like it came from the swamp, it's packed with so much benefits that it can help you lose weight, detoxify and even win a war! The thunder tea broth may be hard to stomach during the first try but have it a few more times and it might just grow on you. It is an acquired taste, really. I used to repulse it but now I love it! For the price, this stall is pretty generous with its portion which makes for a comforting and filling meal to keep your day going.